All metal hardware components, epoxy resin coated and hand tied silicon/rubber. 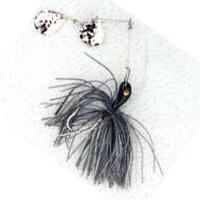 Bass models are 1/8 - 1/2, pike models are 3/8 - 1oz. Muskie model 1 1/2oz. Troll or cast these spins with live baits, plastic lures, rinds, or pork frogs. The WBS is for live bait such as minnows, crawlers, leeches. It uses a smaller round bend Lazer hook. The BBS has larger hooks for Bass and a large barb to hold plastics if used. The PBS model is for Pike, a heavier wire with a safety pin loop allowing the use of a leader. All models are balanced for perfect hop and drop presentations. Note: Additional Color codes for BBS & PBS Only: Black 06, Black/Chartruese 06/12, Brown/Orange 03/13, Blue/Charturuese 16/12. A specialized bait for suspended and bottom feeding fish. The hinge wire design prevents side wobbling of the hook, reducing snagging, and the wire arrangement hinges out straight, thus reducing fish lost during tiring out cycle. The GB4M has two independent blades that slap each other while turning for added noise. Epoxy resin coated and hand tied skirts.